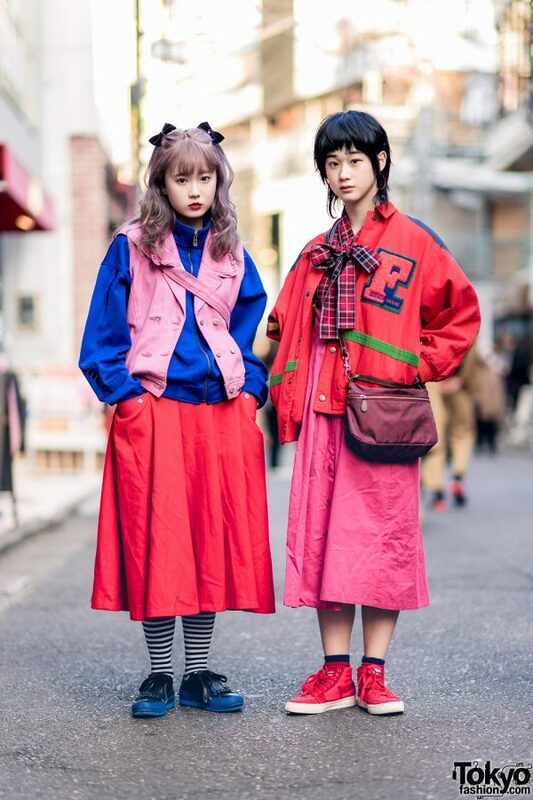 At the left sporting curly purple hair with black bows on her twin tails is Yuno, a 19-year-old fashion college student. She is wearing a pink denim vest from Pink House which features a double-breasted front panel and grommeted strap, and a notched square collar with ruffled trims. 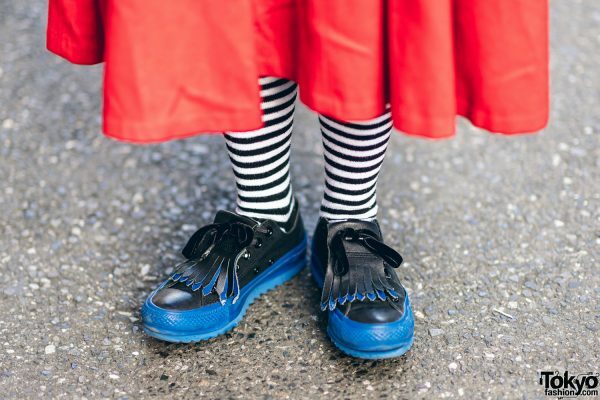 She styled her vest with a resale blue zippered turtleneck jacket, a resale red midi skirt, striped black-and-white tights, and completed her ensemble with a pair of black-and-blue Converse sneakers with fringed accents. 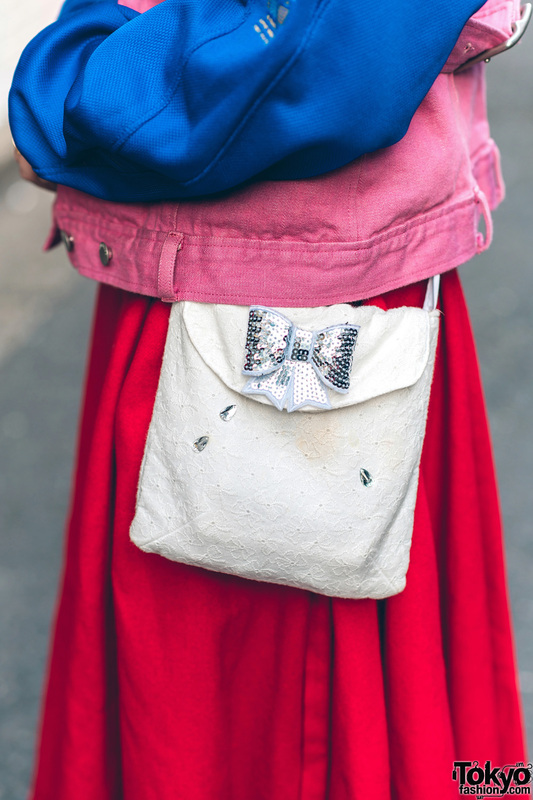 In addition, Yuno is carrying a handmade white sling bag made of eyelet lace with a sequined bow detail. Yuno loves to shop at Koenji’s vintage shops, and she likes the music of American singer-songwriter, Melanie Martinez. For more of her streetwear looks, follow Yuno on Instagram. 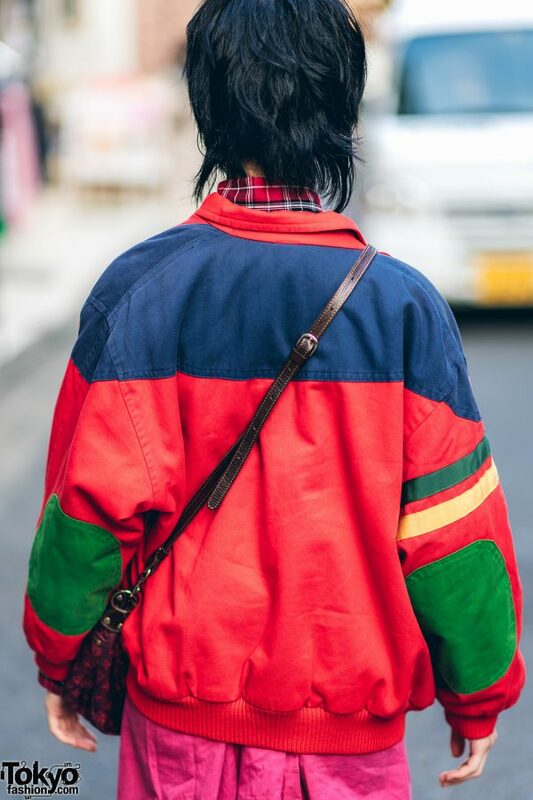 Meanwhile, Maru – a 16-year-old model – is dressed in a red Friend House button down jacket with contrast colored stripes, sourced from San To Nibun No Ichi. 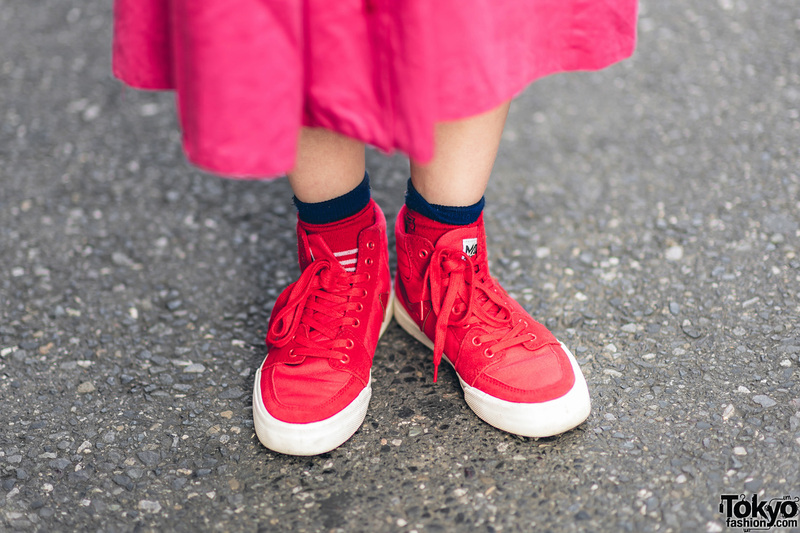 She wore her jacket over a red plaid pussybow blouse, a pink high-waisted button down skirt from RRR, donned dark blue socks and red high top sneakers from Mad Foot. 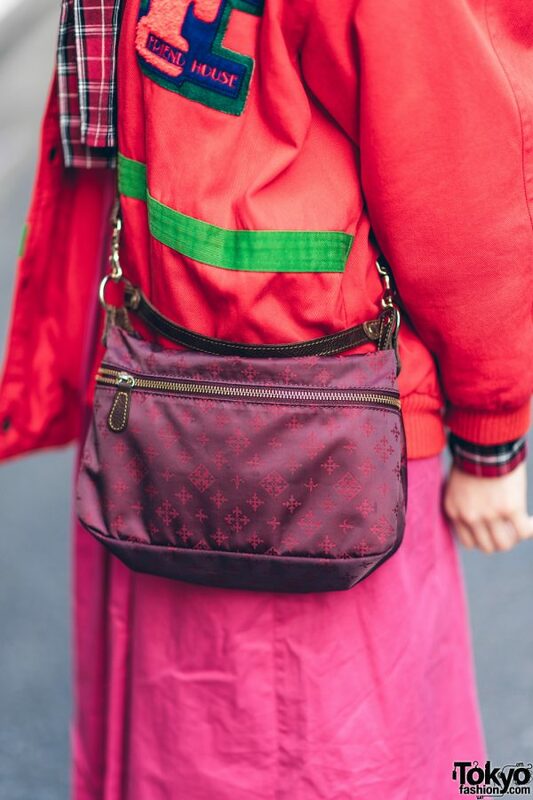 Red oversized hoop earrings and a dark red logo print crossbody bag from Russet rounded out the model’s street style look. 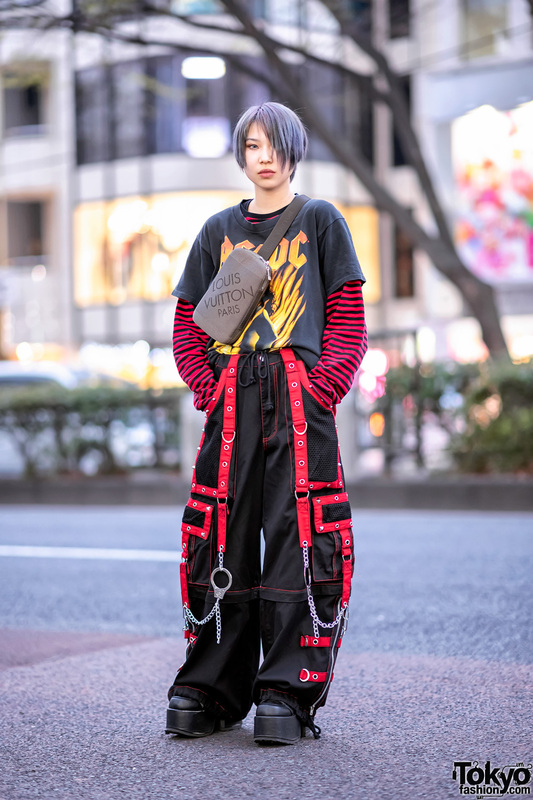 Maru loves to shop at San To Nibun No Ichi, and she likes listening to the music of Creephyp. For her social media updates, follow Maru on Twitter and Instagram.